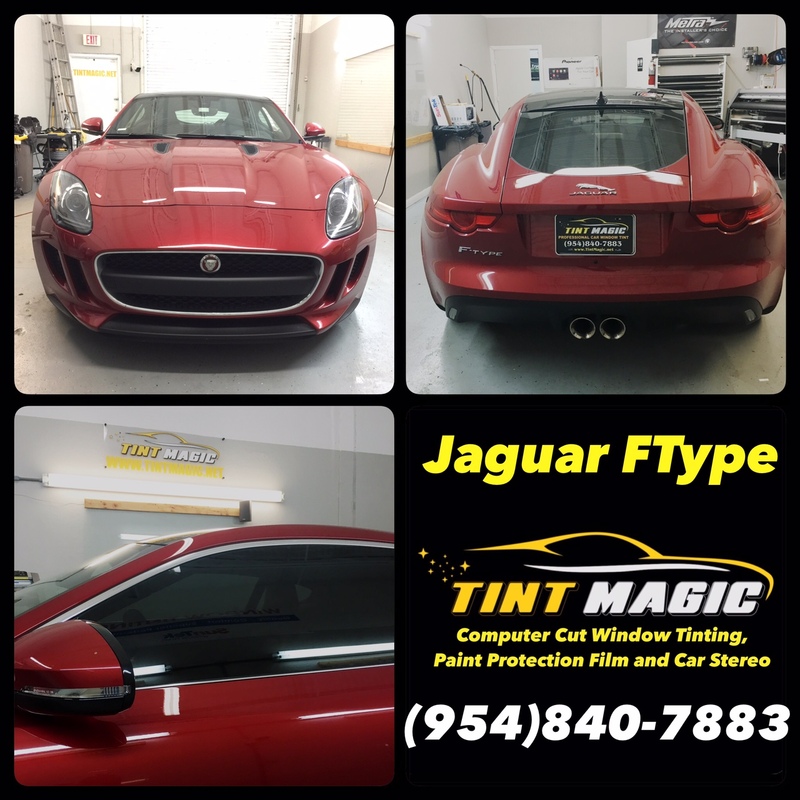 Jaguar F Type at Tint Magic Window Tinting Coral Springs, Fl. We use computer cut system to pre-cut window film before placing over glass. Call us for the best quality and service! (954) 840-7883. 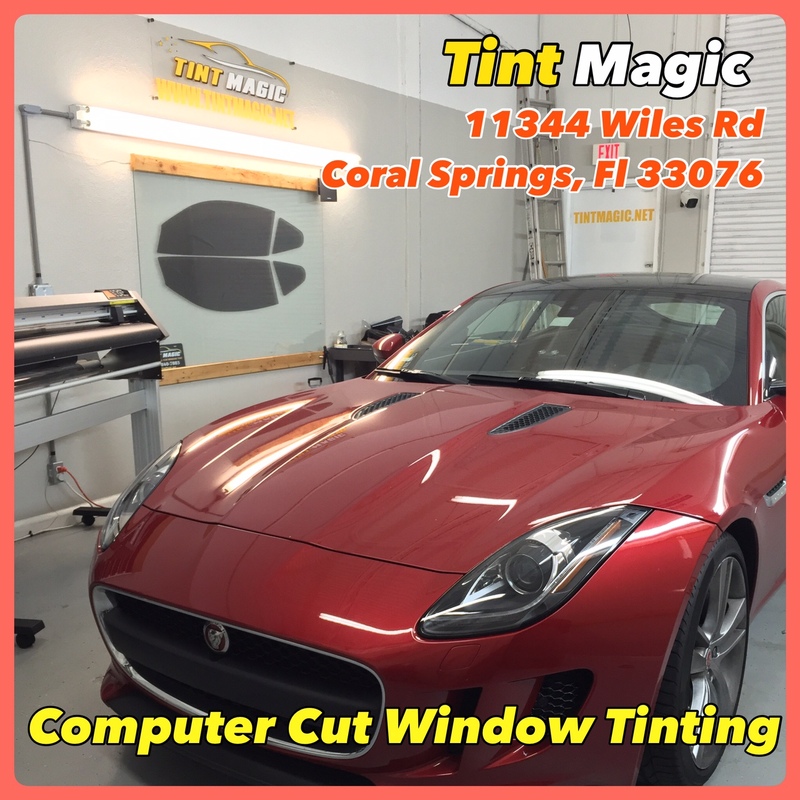 Tint Magic window Tinting is located at 11344 Wiles Road Coral Springs, Fl 33076. Introduced in 2013 as a 2014 model, the F-type is arguably Jaguar’s first real sports car—as distinct from a grand tourer—since the E-type seduced attendees at the Geneva motor show in 1961. Offered in hatchback coupe and convertible editions, the F-type boasts exceptional rigidity with an aluminum-intensive chassis, an accomplishment by the engineering and development team that necessitates little compensatory bracing for the open-top version. The designers created a head-turning exterior that makes the F-type a contender for best-looking ride in a class populated with several beauty queens. Propulsion comes from one of two supercharged engines, a 3.0-liter V-6 and a 5.0-liter V-8. Both the six and the eight are offered in two states of tune, with outputs ranging from 340 to 575 horsepower. A six-speed manual is available with the V-6, and a rapid-shifting eight-speed automatic is optional with the V-6, standard with the V-8. All-wheel drive is available on higher V-6 trim levels and standard with the V-8. The combination of high chassis rigidity, firm suspension tuning, and exemplary powertrains position this hottest of Jaguars on a par with the best in a distinguished class. Add competitive pricing, and the Jaguar F-type makes a compelling case as a world-class sports car with a British accent.